(0 Customer Reviews) | Write Review 7 issues per year International Rental News (IRN) is read by rental companies owners and managers and has a total worldwide readership of around 9000. These readers are in the major developed rental markets and developing areas like Latin America, Eastern Europe, Middle East and Asia. ERA market forecasts; rental award judges; Zoomlion’s access move; peedy 4hr delivery; Norty Turner leaves Riwal; IRE/APEX 2020 dates; Hitachi/Kiesel JV for electric machines. Employee resignations are part and parcel of running a business, but there is a way to manage them properly, says Kevin Appleton. A range of new rental-relevant products, including power tools, aerial platforms, floor strippers and compact earthmoving machines. The latest news from the European Rental Association (ERA). Used equipment values and more from the rental equipment metrics experts Rouse Services. The 3rd quarter RentalTracker finds rental confidence at good levels, although with a hint of cautiousness creeping in. Euan Youdale reports from Istanbul on how Turkey’s rental companies are adjusting to a slowdown and currency devaluation. A round-up of the latest portable air compressors, a key product in many rental fleets. 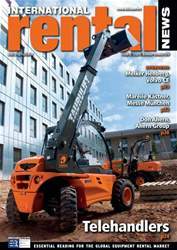 IRN takes a look at some of the latest telehandler models to hit the market, including several compact models. Who are the top 100 contractors in Europe, and who are the fast growers? The 5th International Rental Exhibition (IRE) and 10th APEX access show will co-locate on 9-11 June 2020 in Maastricht, The Netherlands. IRN Reports. 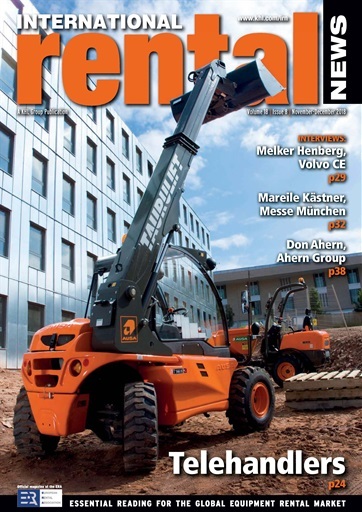 You'll receive 7 issues during a 1 year International Rental News magazine subscription. You'll receive 7 issues during a 1 year International Rental News magazine print subscription.